McGregor's efforts earned him the epithet "Father of the League"
It was an idea that spawned a multi-billion pound global industry; a model that has been copied throughout the sporting world and is acknowledged to have saved professional football from bankruptcy. Yet the man who created the Football League has been largely forgotten - until now. It may seem strange in the polarised world of modern football that a Scotsman was behind the success of the sport in England. 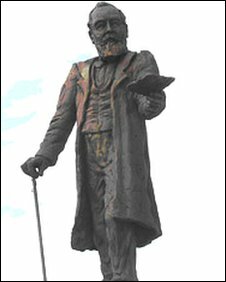 In 1886, the crisis facing professional football south of the border was brought home to William McGregor in a heated exchange with an Aston Villa fan, so it is perhaps fitting that a lasting tribute to this pioneer should be provided by supporters of that club. On Saturday, ahead of Villa's Premier League match with Tottenham Hotspur, a 7ft 6in (2.3m) bronze statue of McGregor was unveiled at Villa Park by Lord Mawhinney, the chairman of the Football League. The statue has been funded by donations to the Aston Villa Supporters' Trust, with additional finance from the club. Peter Warrilow, chairman of the trust, said the idea was formulated in 2002 as a way to celebrate the club's heritage, with a host of famous names suggested for immortality. Mr Warrilow said: "In the end it was a unanimous decision to nominate McGregor, because he was the man who had the biggest worldwide influence on football. "It was his idea that, rather than playing friendly games which had a tendency to get cancelled, people should play in a league which made clubs commit to playing matches." Back in 1886, because of a lack of regular competition clubs were finding it difficult to attract crowds who had grown tired of those meaningless and regularly postponed friendlies. When Villa fan Joe Tillotson forcefully argued this point with club director McGregor, the man from Braco in Perthshire vowed to do something about it. He won the support of first his own club, then 11 of the other leading names, and in September 1888 his Football League kicked off. From the outset he bombarded the press with information on the League, as well as providing them with facilities and regular columns, to ensure the competition received the publicity needed to attract ever-growing crowds. It worked, and continues to, in ways even the visionary McGregor could not have foreseen. In English football alone, McGregor's concept has grown to include more than 7,000 clubs playing in 480 divisions, and the league system has been adopted by most sports across the world. Surprisingly, given his pivotal role in football, McGregor has never been commemorated in such a grand way. There is a bust of him at the Football League headquarters and his image can be seen in photographs and paintings around Villa Park, but he remains an unknown figure to most. "His founding role is one of those things that got lost over time," Mr Warrilow said. "It should have been done a long, long, time ago, but it's having someone who wants to do it to make it happen." The supporters' trust contacted all the league football clubs in England as well as businesses in the Midlands for donations, but received very little response. The project went ahead after six years of fundraising with help from private individuals and two bucket collections held at Villa Park. Lee Preece, Aston Villa's Secretary, said: "Without the supporters' trust this statue project would not have happened. "On behalf of everyone at the club we are extremely excited to be involved. "In 50 years to come, when we are gone, people will say, I'll meet you by the McGregor statue... that will be our legacy." Sculptor Sam Holland copied McGregor's likeness from a few photographs taken of him and a painting of him at a meeting with other directors that hangs in the McGregor Suite at Villa Park. It depicts him standing with a letter in his hand, proposing his vision for the system of future football competitions. Ms Holland said: "He was a portly gentleman and as the son of a draper I imagine that he would have been well dressed and had an eye for style, so I put him in woollen trousers, a silk waistcoat, with a long morning coat, a cravat and an elegant cane." She hired an Edwardian costume from a fancy dress shop in London on which to base her design. It took six months to design and six months to be cast in the foundry and is on display at the main entrance to the Trinity Road stand at Villa Park - a stadium funded through McGregor's idea to turn the club into a limited company. McGregor, despite retaining an unswerving conviction that football club directors should never be paid, fought hard to bring business sense to the sport. However, it remains a matter of conjecture how he would view the split of his Football League in 1992 which led to the formation of the Premier League, not least because he insisted on gate money being shared among the member clubs to prevent anyone gaining an unfair advantage. Aston Villa club historian John Lerwell said the Scotsman and other Victorian directors at the club were business people who wanted to ensure the future of football competitions. "From that point of view, I don't think they would have had much argument with some of the changes that have taken place," Mr Lerwell said. "He might have had a few qualms personally though, as he was a Scottish Presbyterian and had very strong principles. "He may have been alarmed for example at the degree of reliance on commercialism to get the game as far as it has got and maybe even been alarmed at football being played on Sundays." 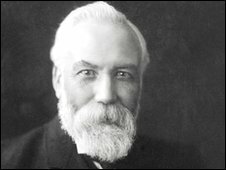 Mr Warrilow said: "[McGregor] was a progressive man in 1888, but whether he would accept the formation of the Premier League is maybe a step too far. "Football supporters want to live the dream of success, but that has been put beyond their reach, when the gap between the richest and the poorest clubs is now so big."